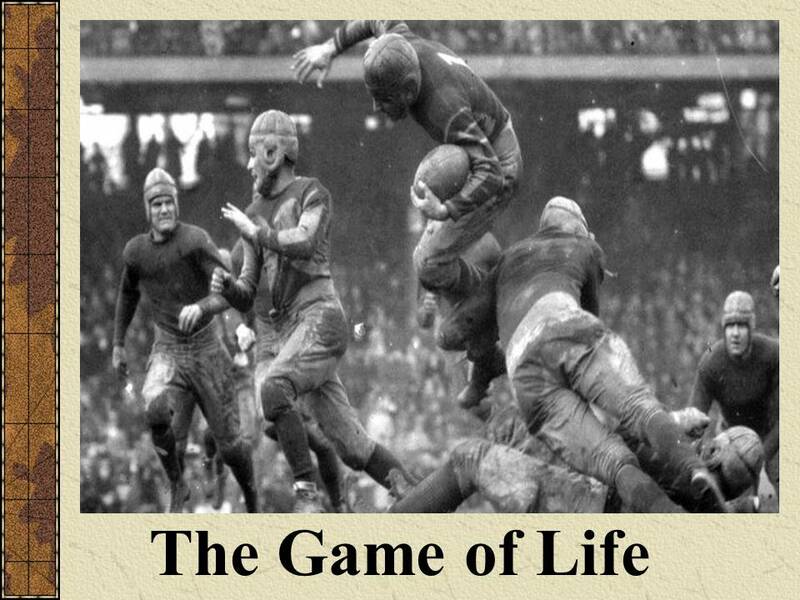 The Game of Life is a Gridiron Classic and an excellent resource to create community or a small group relationship during a men's event. 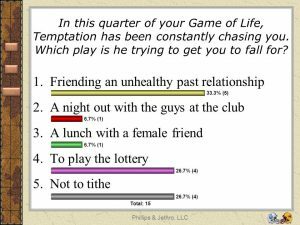 This audio and audience response activity provides an opportunity for men to imagine the plays of Average Christian while at the same time running those same plays in their personal lives. Since the results are collected in real-time, the digital key pad allows the men to answer the questions anonymously then provides the opportunity to discuss the results collectively or around their small group table. Click on the audio players below to hear a sample of the Game of Life, or read the text for a visual rendition of the same. There are several plays within The Game of Life that your men will be able to identify with in their personal lives. Good after noon everybody this is station WORD broadcasting from the great stadium of life. 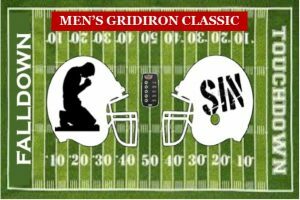 We have for you a play-by-play description of the greatest in most important of all grid iron classic - the game of life - our game here will be on the way in just a few moments. While we'll await the opening whistle, we'd like to point out some interesting sidelights surrounding this momentous occasion. The weather is ideal in the stadium even though it really makes little difference since a game as important as this one must be played regardless of conditions. There is a tremendous crowd on hand today; the stands are literally packed with a great cloud of eyewitnesses as the writer of Hebrews points out. Down on the field we can see that both teams are completing there pre-game workouts. To our right are the players representing Christianity. And this Christian team by the way has the finest of all coaches. Noted for his unerring wisdom, this great mentor Jesus Christ is the model of perfection in the coaching realm. And now it's going to be satan’s team kicking of to Christianity and there the ref eree's whistle as the game is on the way. Its Criticism kicking a high end over end kick, it's taken on the goal line by Average Christian. He starts up the field as Forces of Evil players move in on him, he appears a bit uncertain but he get across the fifteen now he got to his right and picks up some interference its Prayer and Humility. Average Christian is still going up the far sideline pass the thirty (30) with Prayer and Humility out in front clearing the way. There's one of satan’s men trying to crash through and Average Christian sidesteps beautifully at the forty (40) getting away from Temptation. Now he runs with Added Confidence, he crosses the midfield strip and makes his way toward this side of the field. But he left his interference on the other side and now he's by himself down to the forty-five (45), he sidesteps nicely getting away from Hypocrisy and goes to the forty-three (43) doing a nice job in the broken field but there's a player coming up from behind he's gaining, he dives and makes the tackle beautifully at the forty (40) yard line; in Forces of Evil’s territory. Average Christian appeared confident that he was on his way to score, but Temptation sneaked in. It's time to go back to play now at the stadium of life, Christianity out of the huddle and up to the line of scrimmage and here's the pass from Center again it goes to Average Christian. Average Christian is coming around his own left end looking for a chance to cut down field, now he's getting some interference and make his cut. Its Prayer out there again and there's Faith throwing a beautiful block as he got to the thirty (30). He's still going strong, Faithfulness came to add interference to the twenty five (25) as Average Christian running nicely cuts to his right leading his interference he's to the twenty-three (23) by himself heading goal ward. But a couple of tacklers are try desperately to catch him from behind as he get across the twenty (20) he'll have to hurry as he’s hit and fumbles the ball at the fifteen (15) yard line. And the ball is recovered by Forces of Evil. Average Christian, fans, is hurt on the play. He doesn’t get up, Average Christian remains on the ground. This boy Temptation can certainly get in on plays when least expected, he and Little Sins just came from out of no-where to bring about the down fall of Average Christian.